North Korea’s (the Democratic People’s Republic of Korea or DPRK) decisions on nuclear verification matters will not be made in isolation but will be influenced by political, economic and strategic developments. Realistically, the DPRK will seek to retain what it regards as an effective nuclear deterrent until it is convinced it no longer needs nuclear weapons to ensure its survival and the survival of the regime—and until it is convinced that the risks involved with having nuclear weapons, and the political, economic and opportunity costs, exceed the perceived benefit. Accordingly, progress on denuclearization and associated verification will depend on progress on broader issues, especially the development of a peace process and a sustainable relationship with the United States. This paper addresses only verification-related issues, but should be read in this broader context. For any agreement on denuclearization in the DPRK, it will be essential to establish effective verification arrangements. The conventional approach to verifying nuclear commitments, exemplified by International Atomic Energy Agency (IAEA) safeguards, is based on detailed declarations, confirmed by inspections and monitoring. A rigorous approach will be required to achieve the ultimate outcome—complete verified irreversible disarmament. However, getting to this point is likely to require a series of intermediate steps, progressively building confidence and trust on both sides. The broad commitments needed at the outset could be verified by less intrusive, more qualitative approaches, with subsequent negotiations proceeding on a step-by-step basis for more specific commitments and corresponding verification measures. One basic commitment, essential to any ongoing peace process, is maintenance of the DPRK’s halt to testing of nuclear weapons and nuclear-capable missiles. This commitment can, if necessary, be monitored remotely, with no declarations and no inspections, for example by the Comprehensive Nuclear-Test-Ban Treaty Organization’s International Monitoring System and by national monitoring activities by concerned states (national technical means). A further essential commitment is for the DPRK not to expand its nuclear arsenal. The most practical way of establishing a ceiling on nuclear weapons is by a fissile material cut-off—that is, a halt to production of further plutonium and highly enriched uranium (HEU). From that point on in the denuclearization process, declarations and inspections will become necessary, though the details of specific commitments, and the corresponding verification measures, will be matters for negotiation. While cessation of reprocessing and enrichment at the Yongbyon site can, to some extent, be monitored remotely, it will also be necessary to address the issue of enrichment operations undertaken elsewhere in the DPRK. This will require the DPRK to declare fissile production facilities at other sites, and to reach agreement on monitoring and inspection arrangements. Beyond cessation of testing and fissile material production, major areas to be addressed include: (a) a separation plan between any ongoing civilian nuclear activities and military nuclear holdings, with agreement to place civilian activities under IAEA safeguards; and (b) progressive roll-back of military holdings, including warhead dismantlement and removal of fissile material. Specific details to be considered include responsibility for the various verification and monitoring functions, including the possibility of bilateral or regional inspection arrangements and the possible establishment of a Northeast Asia nuclear-weapon-free zone. 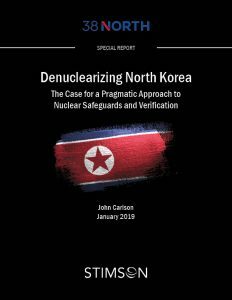 This paper describes steps that could be taken to help lower tensions and build confidence, and at the same time pave the way for the gradual introduction of safeguards and related verification measures in the DPRK. These steps would be verifiable, through verification measures designed for each step. Over time the coverage of verification in the DPRK would be extended. Ultimately—and this should be clearly understood at the outset—assurance that the denuclearization process is successful will depend on progress towards the application of IAEA safeguards to the whole of the DPRK and full cooperation by the DPRK as this work proceeds. Also required, but not covered in this paper, are programs, and appropriate verification/monitoring, to convert nuclear weapons-related laboratories, workshops and factories to peaceful purposes, to redeploy specialists from the nuclear weapon program to peaceful purposes, and to track key specialists to ensure they don’t become involved with nuclear weapon programs elsewhere. The author wishes to acknowledge support and feedback from participants in a closed-door seminar organized by the Carnegie Endowment for International Peace. Leon V. Sigal argues there can be no verification without reconciliation; see Leon V. Sigal, “For North Korea, Verifying Requires Reconciling: The Lesson from A Troubled Past—Part I,” 38 North, December 14, 2018, www.38north.org/2018/12/lsigal121418; and Leon V. Sigal, “For North Korea, Verifying Requires Reconciling: The Lesson from A Troubled Past—Part II,” 38 North, December 28, 2018, www.38north.org/2018/12/lsigal122818. See also the author’s article: John Carlson, “North Korean nuclear crisis: Talks still the best option,” The Interpreter, September 4, 2017, www.lowyinstitute.org/the-interpreter/north-korean-nuclear-crisis-talks-still-best-option. Although the CTBT has not yet gained the necessary ratifications for entry into force, its International Monitoring System is operating provisionally and has played a key role in the detection of the DPRK’s six nuclear tests.